Recently there’s been a lot of buzz surrounding the possibility of the Bitcoin ETF and although this type of buzz isn’t new to Bitcoin enthusiasts, this ETF prospect is becoming more likely. Ever since Bitcoin started gaining traction in 2013, there have been whispers of institutionalization. Banks, hedge funds, and venture capital funds have poured large amounts of capital into the markets over the past few years. The lack of easy access to Bitcoin is an issue consistently holding back investors. For most, buying Bitcoin is a difficult task, as it can’t be purchased through an e-trade account or Fidelity IRA. Institutions refuse to buy-in due to custody risk, and many funds are legally barred from exploring alternative assets. Throughout the years, there have been attempts to create a Bitcoin ETF, initially as a way to get retail traders more comfortable with Bitcoin and now as a way to lure institutions to the party. The first ETF was proposed to the SEC by the Winklevoss twins on July 1, 2013. It took until March 10, 2017, for it to be rejected, sending Bitcoin price down by 25%. In a twist, the months following the ruling saw Bitcoin more than triple in value. How would a Bitcoin ETF change things? It’s evident why a Bitcoin ETF captures the imagination of investors. An introduction of an ETF would signal greater acceptance of cryptocurrency as a financial instrument and be pivotal in drawing in the larger, more traditional players in the investment space. Currently, it is impossible– and illegal, for pension funds, 401ks, and most stockbrokers to offer Bitcoin to clients. An ETF would permit these sources to access and invest in Bitcoin, unlocking billions of dollars in capital. The ETF also allows investors to buy Bitcoin without the risk associated with holding a private key. In fact, key points from the Winklevoss ETF filing involved custody. Many people compare Bitcoin to gold, as they share similar characteristics. Often people focus on the effect an ETF had on gold to gauge the impact of an ETF on Bitcoin. 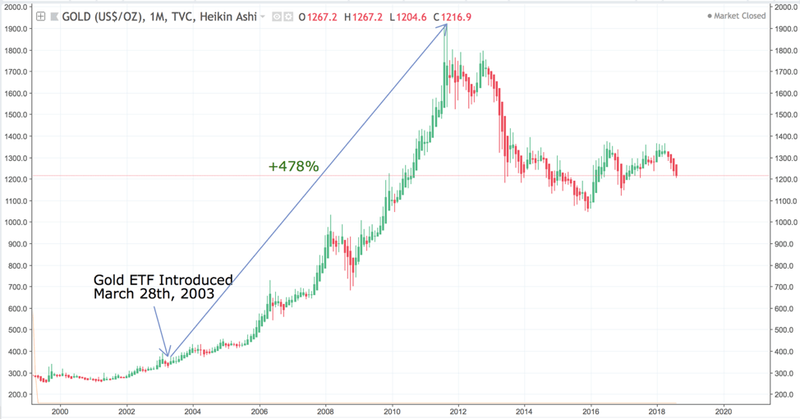 After the ETF for gold was introduced in 2003, prices exploded from $331.60 per ounce to a high of $1,917.90, a 478% increase! Much of the smart money in the cryptocurrency investing space believe a Bitcoin ETF will have a similar outcome on the market. 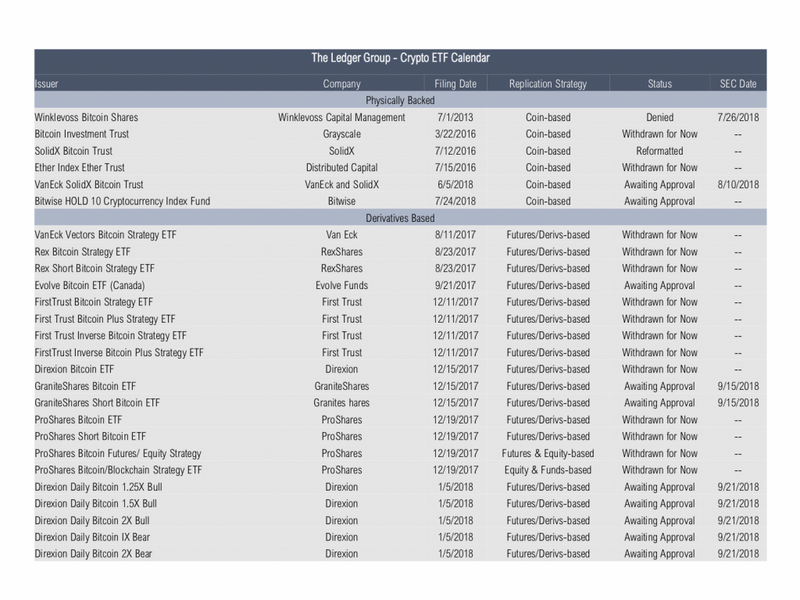 There are currently twelve Bitcoin ETFs being considered by the SEC, and one general crypto ETF. Of the twelve, the most promising ETF is the physically backed CBOE x VanEck which has an August 10, 2018 application deadline. However, many worry this may be denied since last week the Winklevii ETF was not approved. So, what is the SEC looking for in an application? In a January 2018 report on the concerns of Bitcoin ETFs, the SEC outlined five major issues to be resolved before an ETF approval. Valuation: Cryptocurrencies are volatile and trade across multiple exchanges. The fund that sells an ETF will need to calculate end of day net asset value (NAV) for tax and reporting reasons. Due to fragmentation & price variations, this becomes difficult. Custody: Best practices are unclear when it comes to storing cryptocurrency. Futures are cash settled and don’t have to deal with custody. Many of the most promising ETF applications are proposing to actually store & hold bitcoin. The SEC is concerned that the storage may be insufficient. However, recent developments in the custody space (such as Coinbase custody) have made it more likely to be resolved. Liquidity: A key feature of open-end funds, such as mutual funds and ETFs, is daily redeemability. The SEC is concerned that there isn’t enough liquidity in the markets to support redemptions in periods of high stress. They want to ensure funds investing in cryptocurrencies or cryptocurrency-related products will have sufficient liquid assets to meet redemptions daily. The rise of institutional platforms like Coinbase prime are well positioned to deal with this obstacle and are a step in the direction of solving the liquidity issue. Manipulation: The SEC’s role is to protect U.S citizens from fraud and to ensure the integrity of the market. Chairman Jay Clayton has noted there are substantially fewer investor protections in crypto than traditional securities markets with correspondingly greater opportunities for fraud and manipulation, and that he wants to see some accountability in the markets. Another roadblock is the FBI investigation into the manipulation of Bitcoin. If they conclude that manipulation is both rampant (and hard to stop), it becomes unlikely the SEC will approve the ETF. Arbitrage/Volatility: In order to promote fair treatment of investors, an ETF is required to have a market price that does not deviate materially from the ETF’s net asset value. In light of the fragmentation and volatility in the cryptocurrency marketplace, it becomes difficult to ensure fair price through arbitrage. A potential solution is to employ market-makers or to become a maker-marker, although this is hard to solve, and no clear solutions have emerged. While there has been substantial progress on the other four issues, it seems the new applications are not adequately addressing the major problem of Bitcoin manipulation. The arguments made by the SEC for denying the Winklevii ETF centered around the manipulation of markets. Moving forward, applications supporting strong arguments that Bitcoin manipulation will not materially affect investors have the greatest chance of approval. Therefore, CBOE and Van Eck structured their application to prevent such concerns of manipulation. Historically, the SEC has delayed these applications and the August 9th deadline may be postponed, affording more time to alleviate apprehension of manipulation. After five years of waiting for an ETF, long-term investors are anxious to see positive developments, and with smart money pushing for approval, the future is looking promising for a Bitcoin ETF.